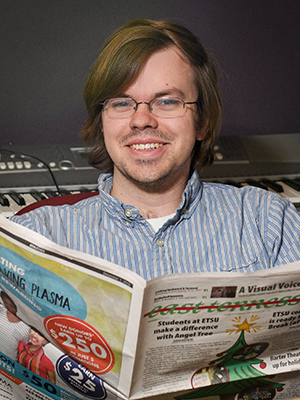 David Floyd is making waves in film as well as journalism. David Floyd stole the competition at the Tennessee Communication Association conference earlier this month with his short film “Due Date.” Floyd graduated from ETSU last May with a degree in journalism, worked as executive editor of the East Tennessean for 2016-17, and he is currently working as a freelance journalist for the Mountain Xpress in Asheville, North Carolina. “My wheelhouse is definitely in journalism and writing but…film was something I had always wanted to do,” said Floyd. “Due Date” is a 10-minute long film about a student who is struggling with the final touches of his thesis. The film begins with Floyd, playing a caricature of himself as a graduating senior, expressing a very awkward and endearing pastiche of carefree dancing in front of a copier which prints off the opening credits. A song by Peter, Paul and Mary plays, which sets up a lighthearted, playful mood and gradually digresses into absurdity. The music in this film has a special purpose. Along with this method of juxtaposing “inspirational” or grandiose orchestral music with the “very mundane” events of a student attempting to perfect a thesis paper as requested by his advisor (played by Rebecca Ingram), the film manages to be both hilarious and horrifying.